When New York State’s first McDonald’s opened on Niagara Falls Boulevard just north of Maple Road in 1959, that part of Maple Road wasn’t even built yet. It was mostly open farm land. 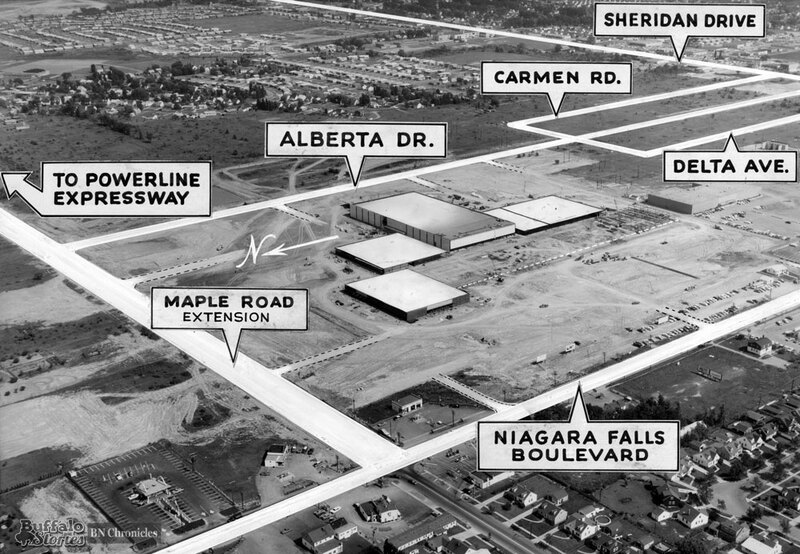 That part of Amherst and Tonawanda quickly developed around the McDonald’s Drive-In, with the completion of the Boulevard Mall — Western New York’s first covered shopping mall — in 1962, the area has been in a constant state of development ever since. McDonald’s was a hit the moment Jerry Brownrout opened the franchise in 1959. Over the first few months in business, the self-service drive-in was frying up 70,000 hamburgers, 30,000 bags of fries, and blending 20,000 shakes a month, and McDonald’s was well on its way to becoming a local and international phenomenon. The location was selling more 15 cent hamburgers than any other in the country. Over the first five years, 250 tons of hamburger was cooked in that Niagara Falls Boulevard location — enough for five million hamburgers. 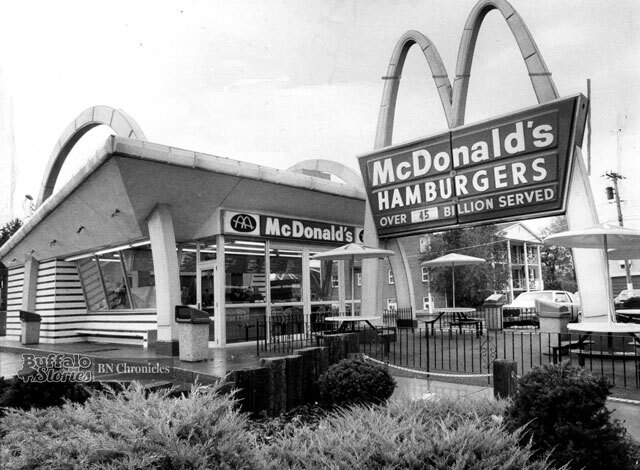 By 1964, there were nine McDonald’s locations in the Buffalo area. Over the last several years, cars crashing into buildings — particularly restaurants like Schwabl’s in 2014 and Kosta’s in 2015 — have led some to begin to think of Buffalo as the “cars crashing into buildings” capital of the world. Recent accidents have even been plotted into maps. Western New York’s attention became focused on vehicles crashing into buildings in 2011, when a car driven through the window at Cheeburger Cheeburger on Niagara Falls Boulevard in Amherst resulted in two deaths of patrons inside the restaurant. At the scene of a car crashing into a bank several years ago, one police captain told me he doesn’t think these crashes happen more than they used to — it’s just that several high-profile cases have called our attention to these types of incidents and the fact that everyone is now carrying a phone in their pocket makes it easier to report on every case. 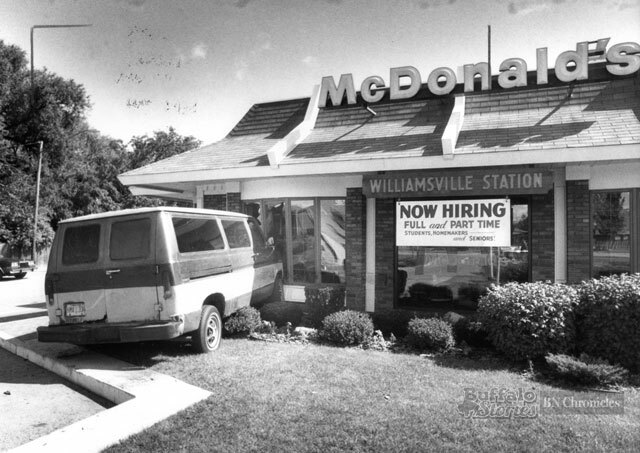 A woman was seriously injured when a conversion van slammed into the side of the McDonald’s on the corner of Union and Main in Williamsville in 1989. 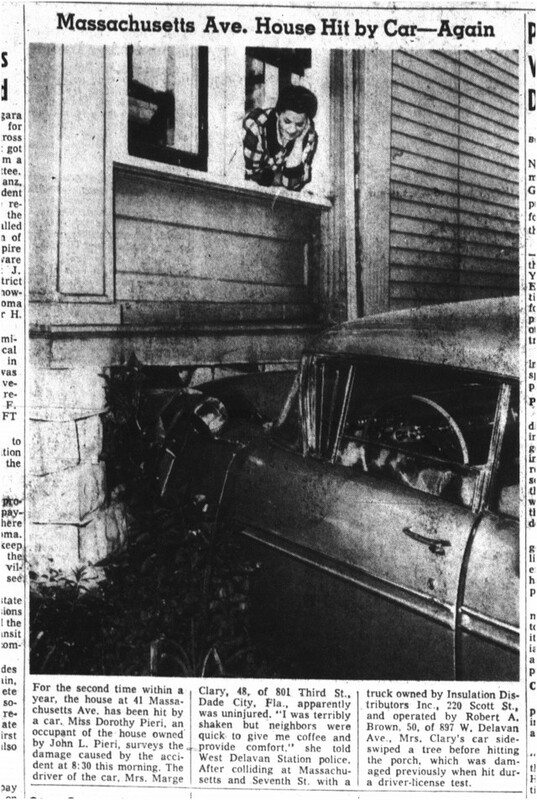 In fact, as long as there have been cars, they have been hitting buildings. Here’s another example from 1959. For more on the trend, and whether Buffalo is actually unique in our number of vehicle/structure crashes, read Ben Tsujimoto’s analysis from last May.